I have lived in Austin for all but one year of my life. In 1996 I graduated from Austin High and then pursued a teaching certification from Texas State University. In 2004 I started teaching at West Ridge. I have taught at two other schools in my short career and feel that West Ridge is a perfect fit for me. I feel very privileged to work for such a successful school district and ensure you that your child is in one of the best districts in Texas. I'm married to a beautiful wife and together have a five year old boy named Casey. 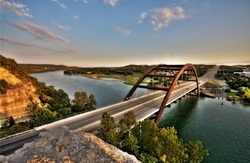 During my time off you can find me boating on Lake Austin or running Lady Bird Lake.